Get Outside and Run This Winter! It’s inevitable. When the days get shorter and the mercury dips, the gym gets busier because people don’t want to exercise outside in dark or cold temperatures. Sure, there are days when snow, ice or frigid temperatures make running outside a dangerous option. But, for the rest of the winter, running outdoors provides many physical and mental health benefits that you simply can’t get from a treadmill or track. Running in the cold is invigorating. It leaves you with a sense of accomplishment that you will never get from the confines of a treadmill. And, when you run in the cold, your body works harder and burns more calories! It can also curb the winter blues. Yes, a dose of fresh air and sunshine can help boost your mood and keep you motivated. While running in the snow is tough, it can build strength and speed, and make you feel that much faster when you hit the smooth surfaces. It can also slow you down, but for many that is a good thing! The winter is a great time to allow the body to recharge and take a break from the demands of intense training. If you are preparing for a spring race, treadmill running can leave your training a bit flat. It can’t give you the same graded and uneven surfaces as a road, bike path or sidewalk. Running in intense weather can build your mental and physical toughness because it programs your body to operate better in adverse conditions. This also better prepares your body for race day. In order for you to be comfortable in the snow and freezing temperatures, you need to have the right gear. Invest in moisture wicking materials that are reflective and light weight, yet warm. Avoid cotton because once it gets wet, it will not dry and you can get very cold! Key areas to keep warm are your extremities. Protect your hands, ears, and toes by wearing a thermal hat, wool socks and gloves or mittens. When it's extremely cold, mittens are a better choice, and you may need to layer them with a light pair of gloves underneath. You may also need to wear Shoe Hoodies or place duct tape over the forefoot of the shoe to keep the toes warm. In windy and bitterly cold weather, use a thermal winter face mask such as the Seirus face mask to keep your nose, cheeks and neck warm. For asthma sufferers, this can also help humidify the air you breathe making running in colder temps more comfortable. For the upper body, layering is key, and two layers (long sleeve dry fit tee and windproof jacket) are typically enough. Aim to dress 10-15 degrees warmer than it is. You should feel cool at the start of the run, and by mile one, warmed up. Or, warm up thoroughly before heading outside to avoid that first mile chill. Note that if the winds are 20 mph or more, I would recommend staying inside. The layer closest to your body should help wick the sweat away, keeping you dry and warm. The outer layer should protect against wind and moisture, but at the same time be breathable. If it is very cold (5 degrees or less), you will need to add a middle layer consisting of an insulating material, such as fleece. This layer must continue wicking moisture away from the skin and still be breathable. Your legs generate a lot of heat so you typically don't need as many layers on your lower body. You can usually wear just a pair of fleece lined tights or running pants made of wicking material. If it's below 5 degrees F, you may want to consider two layers on your lower body: a wicking layer of tights, and a wind-proof layer such as track pants. Staying safe and injury free is important. It’s a good idea to run with a buddy or carry a phone for emergencies. For snowy or icy conditions, run with caution and use some sort of apparatus to put on your shoes (such as Yaktrax) to help with grip on snow and ice. If it’s dark out, wear bright colored or reflective clothing, carry a light and stick to well-lit paths not only for safety, but also to avoid icy patches or potholes. Avoid using headphones or keep the volume low and one earbud out so you are able to hear and be aware of your surroundings. And of course, always let someone know where you are going! I have learned to appreciate the beauty of winter by running outside during these cold winter months. Whether it’s an evening run to look at holiday lights, a daytime run through freshly fallen snow, or a sunrise gleaming over hoarfrost covered trees, winter running can be beautiful! So, next time you’re thinking of hitting the treadmill or track, check your weather app and consider heading outside. With the right gear, you can take advantage of all the benefits that come along with running in the great outdoors! Mary Chestolowski offers running classes for beginner to advanced runners and is available as a Personal Running Coach. If you have an upcoming spring race that you need help with, contact Mary! Look for spring class offerings in the 5k, 10k and half marathon distances. Personalized training plans are available for any distance up to the marathon. She also offers personalized and group strength training. Contact her at mchestolowski@racmn.com if you have questions or would like more information. 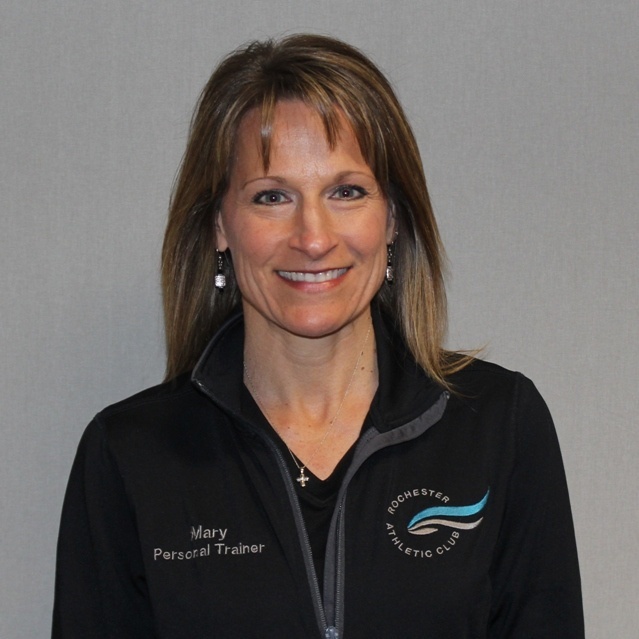 Along with being an ACSM Certified Personal Trainer, Mary is also an RRCA Certified Running Coach. She is also known locally for running road races and has won the Med-City Marathon twice. Mary is a mother of four busy children ages 9-21 and enjoys spending time with them and attending their activities. She also enjoys traveling, interior decorating, baking and planting flowers. Contact Mary Chestolowski at (507) 287-9335 ext. 346.